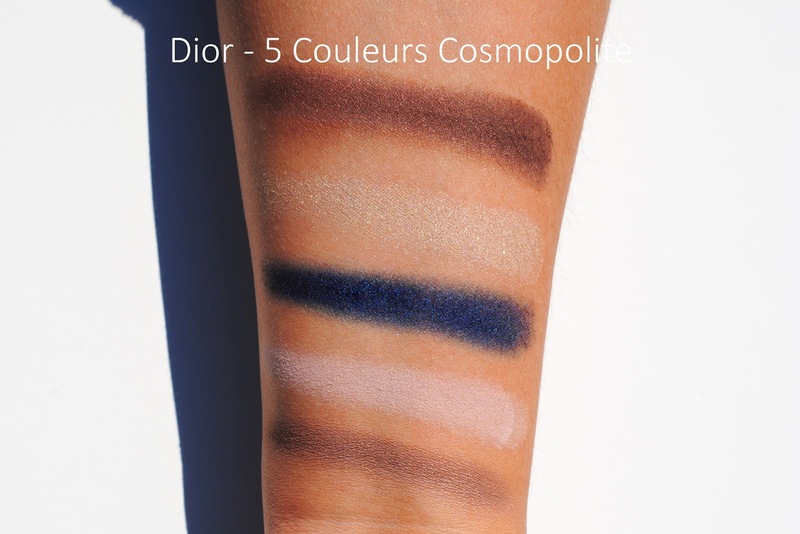 The 2015 Dior fall collection is called 'Cosmopolite'. The Dior woman is mysterious. Playful, tempting, carefree, refined, intriguing and adventurous at the same time. She doesn't let people label her and determines her own rules. She does things her way. This is what Peter Philips had in mind when he created his first color collection. A creative loveletter to women in the form of a fall collection that gives room to experiment. The eyes are metallic eyecatchers in this collection. Almost every Dior collection has the famous little black palette. This time with 5 cosmopolite colors. There are two different palettes, one with a golden undertone and one with a silver. The silver palette has a cool undertone with colors like khaki, brown and bordeaux. I got the palette with golden undertone with warm colors like denim blue and amber. I'm a little bummed by the swatches, they are 457x times prettier in real life. Especially the blue and gold are way more sparkling and vibrant. The matte colors are like I know them, they apply well and are very soft. The two brown colors are also very well pigmented and both have a nice shine. The gold color is the middle one, and it definitely is the eyecatcher of the palette. In real life, in the sun, oh wow. An amazing glittery shine! You'd buy the palette just for this one color. The blue color is very pretty, it's the denim blue color that you see on the photo above the swatches. I love it, but it applies not so well as the other colors. This one has more of a grainy texture. I was so curious about these hybride metallics. They are called Dior Addict Fluid Shadows, and the packaging is in the typical 'Addict' style It does look a bit different because it has a black accent instead of silver. I like the packaging a lot. The shadows are available in 6 colors. I got them in 025 Magnetic and 275 Cosmic. Both colors are amazingly pigmented and the colors are beautiful. Again, the photo does not capture how it sparkles in sunlight. Especially the silver one impressed me when I saw it, never seen so much sparkles! This liquid eyeshadow applies easy, dries very quick and the brush is perfect to use it as a liner. The negative thing I heard about these is that they don't blend very well. I personally would not use a metallic liquid eyeshadow for blending purposes. There are lots of powder eyeshadows that are perfect for blended looks, but this one is so pigmented and dries so quick, I just make a graphic look with these, no blending! And if you like blended edges I would recommend doing the full lid with the fluid shadows and blend a powder eyeshadow over the color in the corners. That way it looks perfectly blended and still popping in the middle. Problem solved! The fourth product (or third if you count the two shadows as one product) is a brow pencil. This one is called Sourcils Poudre and I got it in the color 'Dark Brown'. I usually use just powder, because my previous pencil (Catrice) was really bad. This one can draw sharper lines, gives off more color and works so much easier. Now I use this one to draw the outer lines and fill in gaps, and the powder to fill in the entire brow. The finish looks more like a powder result by the way, that's why it's called 'Sourcils Poudre'. I am loving these four products. My favorite is the Fluid Shadow, because it's so highly pigmented, covering and metallic - and still easy to use. I usually use it as an eyeliner, or to embellish black eyeliner. When writing this post, I have a little line at the end of my wing in the silver color, subtle, but it looks very pretty. Do you use a pencil or powder for your brows? Everything in this post is so beautiful! They all have such pretty colors and especially the palette! Wow, de donker blauwe oogschaduw uit het palet vind ik prachtig! Wow die Oogschaduw palette zet ik meteen op mijn wishlist. Echt een prachtig palette! Die wil ik!